Near the Bamboo Grove in Arashiyama, you'll come across the entrance to the Ōkōchi Sansō Villa Gardens. After traipsing through the groves and narrowly escaping peak tourist hour, we were in need of a break from the selfie sticks and loud tour groups. Dan poked his head inside. From the admission gate, it looked like there wasn't a soul inside. The fee seemed steep at Y1,000 ($10) but Dan made the executive decision and plopped down a few notes, and we were inside. Y1,000 might look like a lot for a self-guided walk through an old garden, but it was some of the best money we ever spent on the trip! Immediately as we passed through the gate and started to walk up the hill, the noise from the tourists below disappeared. We could hear our footsteps on the stones below and the sound of the wind in the trees. It wasn't until the very end of the tour that we ran into another person. It was the perfect escape from the crowds below and more beautiful that we could have imagined. 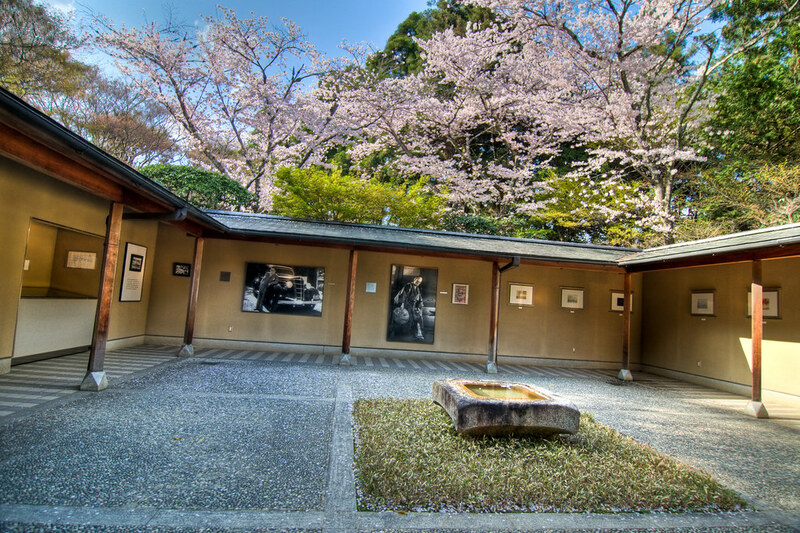 The Ōkōchi Sansō was once the estate of a famous Japanese actor Okochi Denjiro (1898-1962). He became a star at a young age but instead of blowing the money on cars, drugs or clothes like young stars do now - he decided to build this monument to Japanese architecture. He built this villa and the gardens as an escape, and after his death, it was opened to the public. Now, it offers to the public, the same sense of escape it once offered him. The buildings within the garden have been recorded as cultural properties by the national government. Most of them were constructed in the 1930's and 40's except for the Jibutsudō, which is an original structure from the Meiji Era which was moved from its original location to this site after Okochi Denjiro purchased it to save it from destruction. To set off on the walking tour of the gardens, one only has to follow the signs along the pathway. The things you'll pass by is the Chūmon. A Chūmon, or "intermediate gate", is built to divide the outer and inner tea gardens. It is where the host would meet his guests as he invited them inside for tea. Stepping through the gate, is like being welcomed home. After passing through this gate, you come upon the main building in the compound, the Daijōkaku. This is where Denjiro Okochi’s bedroom used to be and where he would spend most of his free time when he wasn't entertaining in the tea house. The house is known for being one of the best examples of traditional Japanese residential architecture. It combines many different styles of Japanese architecture such as shoin-zukuri and sukiya-zukuri. These architectural styles seem in direct opposition, the one being for large, opulent houses and the other, meaning literally, "a small space, simple and austere". The shinden-zukuri was a style of architecture that flourished in the Heian period. These buildings faced south, were comprised of a single story and were raised off the ground with wooden pillars. There was no tatami flooring, and the roof was made with cypress shingles. Sukiya-zukuri architecture is all about the use of slender wood elements and the simplicity of ornamentation. From the front of the Daijōkaku, you have a lovely view of the forest and the mountain to the south. But this view pales in comparison to the one you get at the top of the garden path. After taking in the view here for a bit, we headed back off on the trail. The upper portion of the trail shows off the garden's flora and fauna. The garden was designed to highlights all the different seasons. So no matter when you came to visit, there is always something stunning to see. Unlike some gardens were they only have one season of truly spectacular foliage or flowers; this garden can be enjoyed throughout the year. In the spring we have cherry blossoms, azaleas in the summer, Japanese maple trees for the fall, and pines tree for the winter months. Up until this point in the trip, we hadn't seen many autumn colours since it was fairly early, but here, trees were starting to change colour, and the orange and gold leaves glowed against the crystal blue sky. The grounds themselves take up about 20,000 square meters, and the guest pathway only shows you a small portion of the villa. One can only imagine what treasures are hidden amongst the rest of this estate. Throughout the stone path, you'll discover Buddha statues, water features and sculptures hidden in-between Cyprus trees and rose bushes. At the top of the path, you'll come to a lookout point where you can see the slopes of Mount Hiei, Mount Arashi and Mount Ogura and the Hozu River gorge. Wandering in the Bamboo forest you can't see out to the landscape around you at all, but from up here, we saw things we never even would have known were there! Hidden in the mountains, you can see a tiny temple, poking its head out of the trees. Thie is the Daihi Kaku or Senkaku Senkoji temple. Its iconic coloured flags make it stand out amongst the green trees. There is a term in landscape architecture called “borrowed scenery” which means: "to incorporate the background landscape into the design". Walking through the winding cobblestones and twisting pathways, you can understand this design as the garden and the forest seem to be intertwined into one. The Jibutsudō, with its Irimoya style roof, is a Buddhist shrine which was moved from its original location to the villa in Arashiyama. Jibutsudōs are buildings from the Meiji Era were made for rich noblemen to practice Buddism in the comfort of their own homes. A private place of worship. Along this path you'll also find the original Chashitsu. This small tea room was designed for intimate gatherings with typical tea room features like soft, sliding doors made of wooden lattice covered in a translucent Japanese paper, tatami mats and subdued colours. The piece-de-resistance of the whole estate, in my opinion, is the Moon Light Pavilion. This open-air building is at the highest point in the garden and gives you the best view of Kyoto, the forest and the mountains. All framed under a simplistic Japanese gazebo. Sitting here you'll feel on top of the world. The landscape below looked like a rainbow from here, orange and yellow trees, green mountains and the bright blue sky. After the moon pavilion, we headed back down the trail to finish our tour off with a cup of tea. Near the exit is a new tea room built which was made to serve tea to all the guest which still visit this site, keeping Okochi Denjiro's tradition alive. 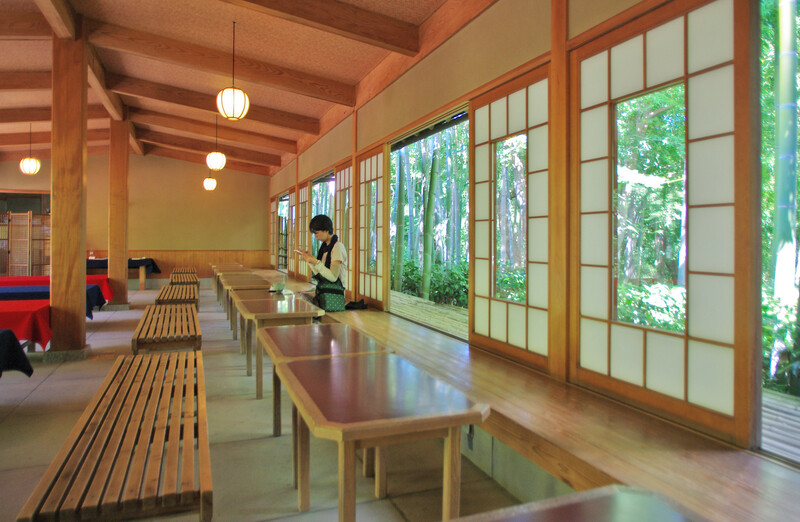 Inside this building, you are seated and served a hot cup of matcha tea and a little sweet treat alongside. We took a seat towards the back of the room with a view of the bamboo forest behind us. Here, surrounded only by a few other visitors, we had a private viewing of the famous bamboo forests where hundreds of tourists were crammed inside only hours earlier. The tea itself was a welcome treat. It was a sunny but chilly, windy day, and the warm liquid hit the spot. The matcha is slightly bitter and is purposefully served with the sweet candy cake to balance out the flavour of the tea. We sat quietly in the tea room for as long as we felt welcome (we honestly could have been forever). I read my guidebook and planned our next destination, Dan changed his phone and relaxed in the silent chatter of the tea room. We listened to other families talking about their travels and took a moment to step back and appreciate where we were, what we had done and what adventures were around the corner. We said "arigato" and bowed deeply to the servers as we left. One the way out we saw so many people approach the gate and turn away once reading the admission price. We shook our heads and smiled at each other like we had just uncovered a secret only we would take away with us. Don't make the same mistake those people did. Come inside and soak it all in. Your secret garden awaits.